Cassie: There’s a difference between thinking you might not make it home and knowing you won’t. Oh Mother Nature, why have you forsaken us? Are we really all that bad to you that we deserve what you’re giving us? Not only have you fought back with global warming and disastrous storm activity but now you insist on dooming us on film as well. SUNSHINE, from director, Danny Boyle, does not announce distinctly when it takes place. Regardless of the time, the sun is about to give out on us. It has been slowly dying over the centuries and its warmth is finally waning on earth. After one unsuccessful attempt, the people of earth have pooled their resources together to send one last chance into space. The crew of Icarus II must travel through space for what can only be millions of miles (it may even be billions but I’m no space enthusiast) to reach the sun and drop a bomb into its center in hopes of reigniting its flame. Boyle’s SUNSHINE is a visual hot bed that draws the viewer into its world of dichotomies. 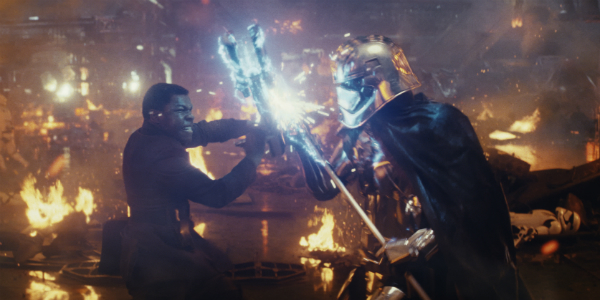 From light and dark to close and far, the opposing forces manifest on the screen to make for a gripping debate between whether it’s better to fight against fate or resign yourself to it. Staring directly into the sun is damaging to your eyes while staring directly into Boyle’s SUNSHINE will delight them. Boyle makes calculated visual and sound decisions that allow the viewer to feel like a crewmember on this momentous voyage. Long corridors are often devoid of noise and shown stretching on toward far depths before cutting to tight framing of various crewmembers (Cillian Murphy, Michelle Yeoh and Chris Evans, to name but a few). The rooms that find these solitary crewmembers vary in style from simulation rooms that show the glory of the sun’s power to the payload room that houses the bomb that will hopefully save humanity, from rooms with wall-to-wall computer screens to oxygen rooms dedicated to the growth of plants. With so many rooms to speak of, Icarus II feels like its own world. With the people of this world alone in each of these rooms that make up this separate existence, the detachment from each other is only second in intensity to the distance between this ship and the planet it has left behind and lost all communication with. Determined to complete the mission they have set out for must outweigh the fear they feel being so completely secluded as their drive in order to survive. Author of THE BEACH, Alex Garland, has crafted a script that plays out like a morality debate. The importance of the individual is weighed against the significance of the masses in some moments, while the needs of the masses are then weighed against the natural progression of the species in others. Fate and the usual bickering over whether we have any say in the matter permeate the entire mission, mostly against Boyle’s better judgment. Garland’s exploration of God and atheism were not elements that Boyle wanted to devote much screen time to, if any, but they still manage to make their way to the forefront. It seems curious to me that he would want to avoid these topics, as SUNSHINE needs them to further enforce its own sense of urgency. If this mission is unsuccessful, the sun’s warmth will inevitably cease to reach the earth. Come the time when all of earth’s inhabitants begin to reach their freezing point, the existence of God is going to be the hottest topic around. 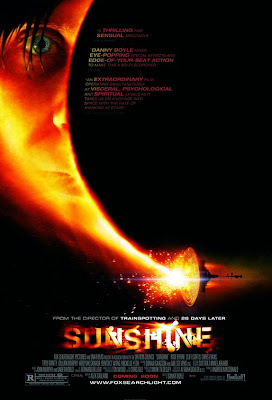 SUNSHINE will definitely draw comparison to Stanley Kubrick’s 2001 (it’s doing it right now even) with its soft-spoken computer voice commanding the ship and eerie, quiet emptiness. While it won’t come anywhere near having the same impact, it is still a strong successor. Boyle modernizes the space solitude tale by jumping back and forth between quiet calm and frenetic dizziness, between dusty and stale and bright and explosive. As the mission wreaks havoc on the minds of the crew, Boyle plays with our senses, making SUNSHINE an engaging, tense and thought-provoking trip to the center of the sun. Really though, can you imagine it any other way?